I have NEVER liked Macarons, I admit it. I just didn’t GET them… until last month. I FINALLY had a GOOD macaron and now I’m in love. When we decided to make recipes for National Chocolate Mint Day for our Celebrating Food round up this month I knew JUST what I wanted to make! So before I got started I did a TON of research. 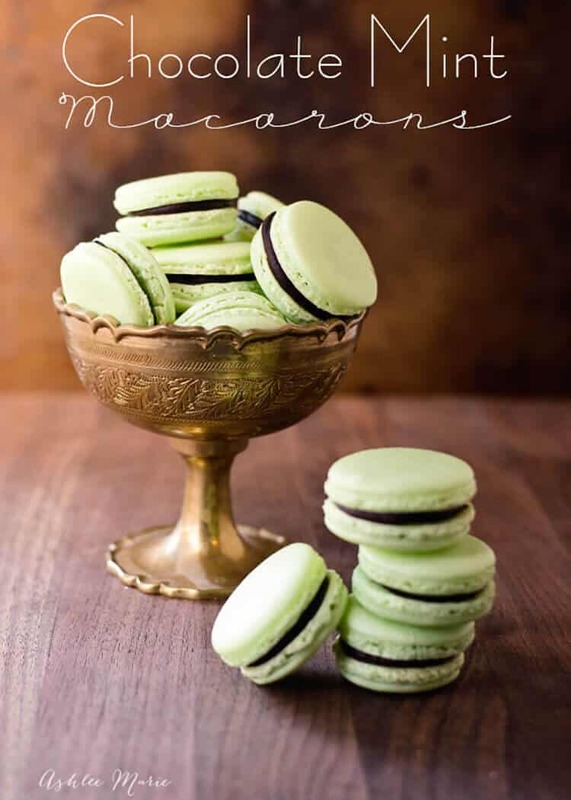 Online AND asking friends that I know have made macarons (successfully – Thx Cynthia). I heard such scary stories about making them that I was a little nervous. So I spent a few days learning everything I could (like the difference between Italian and French macarons – these are french), then I just bought everything and got started! Up until the point that I opened the oven door and saw those perfect feet on the shells I wasn’t sure if it worked! PHEW! 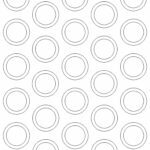 Print your template and place in pans (2-3) under parchment paper - OR draw 1 1/2 inch circles on the underside of your parchment paper. Stir the sugar and egg white powder into a small bowl. In another bowl sift together the almond meal and powdered sugar at least twice. In a copper or grease free bowl add the cream of tarter to your egg whites, beat them on low speed until foamy (with a hand mixer or by hand - not a big machine mixer). Slowly add the sugar/egg white powder mixture as you beat the eggs. Increase the speed to medium and beat until almost stiff egg whites, still glossy, but more firm that soft peaks. Beat in food coloring gel, until uniform. Gently fold in 1/3rd of the almond mixture. Once its combined, add another third of the almond mixture, fold, and so on. Add your batter to a piping bag with a large round tip (around 1 cm or less) and pipe rows of macarons. Pipe into the smaller circle they will spread to the larger circle. Pre-heat your oven to as close to 290°F as possible, a little over is better than a little under. Bake the cookies for 16-18 minutes. One sheet at a time. for more scientific posts on macaroons check out these posts by "not so humble pie"
use a template – otherwise you’ll have a hard time matching up sandwich halves. egg whites – AGE them, separate them, throw the yolks back in the fridge, or in a recipe, and leave your egg whites out (and covered) for 1-3 days. hand mixer – You guys KNOW I love my bosch, but it is SO powerful that it easily OVER beats egg whites (so does the kitchenaid stand mixer) so it’s best to stick with a hand mixer OR whisk by hand. oven thermometer – ovens can be WAY off, I suggest this for EVERY baked recipe, my oven is off by 25 degrees! 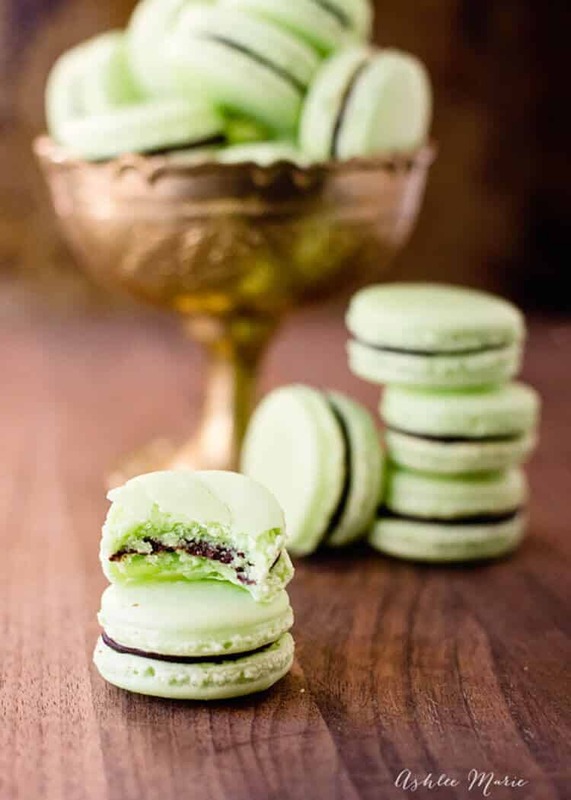 I have never even tasted a macaron, but these make me want to. That chocolate ganache in the middle looks sooo good! I’ve never liked them until I tried a GOOD one, time to try another recipe, see if I can make more that I love. 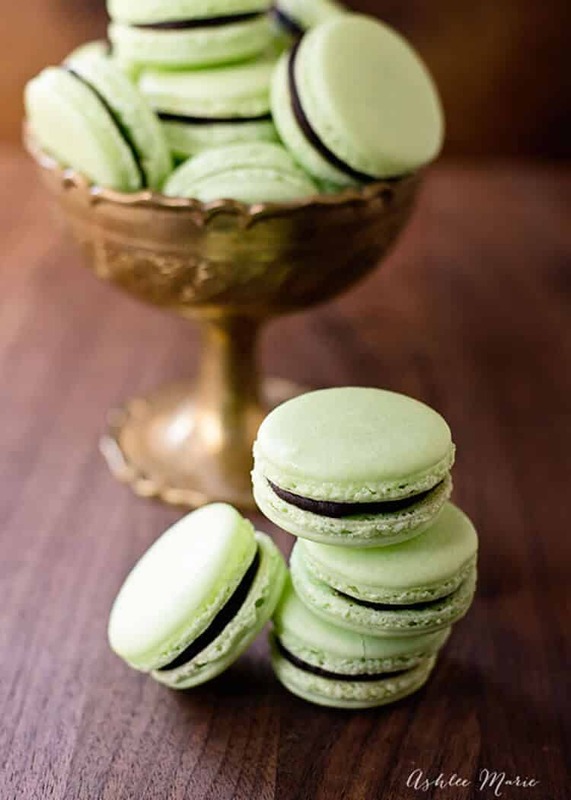 Can you believe I’ve never eaten a macaron, or obviously never made them either. Now you need to teach me how to make these, so I know how but also so I can enjoy these delectable cookies! we should totally have a cooking day, I used to love doing that with my other foodie friends in other places I’ve lived. we’d have a blast! These macarons are so perfect! I love the idea to use a template. I’m excited to make some! Thanks for all the great tips! I hope it helps! can’t wait to see what you make! maybe a cupcake flavored macaron? I’ve never had a macaroon and all the horror stories scare me out of making them but yours look delicious! Love your tips! I was worried too, but got great advice! so much info out there to help too! you should totally give it a try! These are the perfect little recipe to make in a gift bag as part of a Christmas gift basket! So pretty and delicious looking! yup, perfect for Christmas gifts! 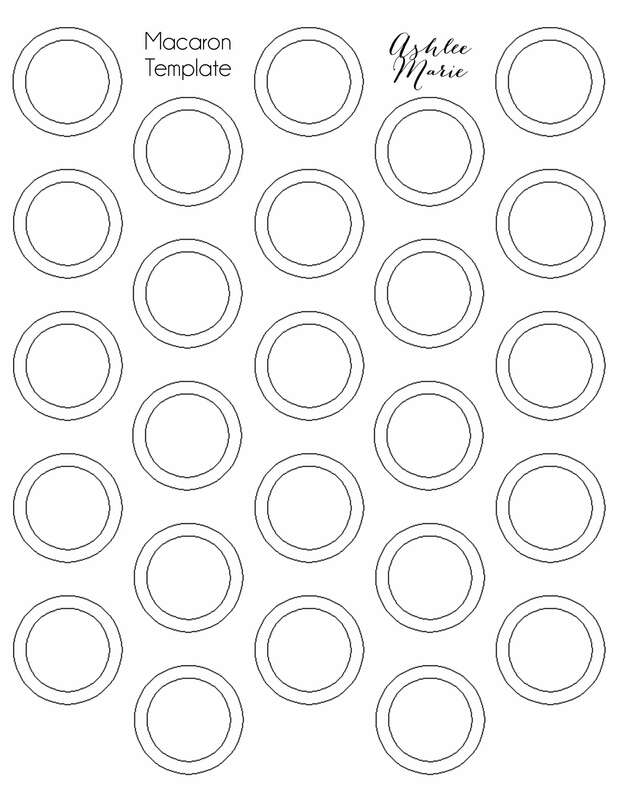 I just tried printing off your macaron template and it is having issues- it is printing off extremely small. Any tips to get it to the right size? Can’t wait to make these. Thanks tonz for the recipe! hi there, just wondering if there is anyway to convert the powdered egg whites to fresh egg whites? i can’t find the powdered ones at my local supermarket! Is there anything I could use other than egg white powder? I’ve used recipes without egg white powder but I didn’t have good luck with those recipes. so yes you can, but I think it helps stabilize the recipe better to use it.